MK Nissan Slomiansky discussed the Jewish Home's tough situation following departure of Bennett and Shaked. 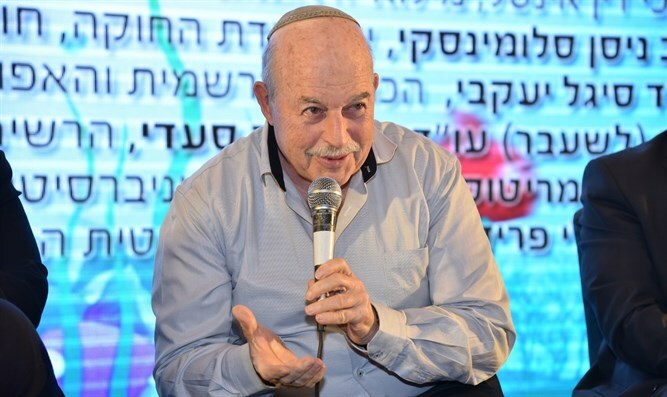 MK Nissan Slomiansky (Jewish Home) on Thursday discussed the situation of his party, which is without a leader after Education Minister Naftali Bennett and Justice Minister Ayelet Shaked quit the party and founded HaYamin HeHadash (the New Right). "The act that was done is not good, and was done at a particularly bad time," Slomiansky said at a conference of the Israel Bar Association in Eilat. "An election campaign has begun and we are starting all over again. There is no chairman and there is no system of how to elect Knesset members. Going to primaries is no longer relevant because there is no money due to the situation that has arisen. We need a rehabilitation,” he continued. “I do not think there was ever anyone who had to file bankruptcy and then rehabilitate himself within a month," added Slomiansky. The Jewish Home on Wednesday cancelled its primaries, announcing that its Central Committee would convene next Wednesday to approve an amendment to the constitution of the party. The amendment will determine that the chairman of the party will be elected by a "public council" of 13 members, including public figures, elected officials and representatives of party institutions. In addition, the Jewish Home list for the elections to the 21st Knesset will be chosen by members of the party Central Committee.